Although many Berliners might not agree, Berlin’s S-Bahn and U-Bahn system is fairly cheap â€“ especially if you know some special fares. So let’s look into them! A Berlin bus stop. The “B” on the right side tells you in which fare zone your are. Before you continue reading: Are you or will you be a student of a public university? If yes, you can stop reading here. ðŸ™‚ Because as a Berlin (or Potsdam) student, you automatically receive the Semesterticket, a fairly cheap transit pass for Berlin and its surroundings, even incl. free bicycle carriage. the BVG, operating the U-Bahn, trams, busses â€“ and even ferries. But to make sure this never happens, here are some tariff basics. Zone A: Everything inside the Ring and the Ring itself. Zone B: Everything outside the Ring â€“ but inside Berlin. Zone C: Berlin’s surroundings, up to around 15 km. And the whole of Potsdam. 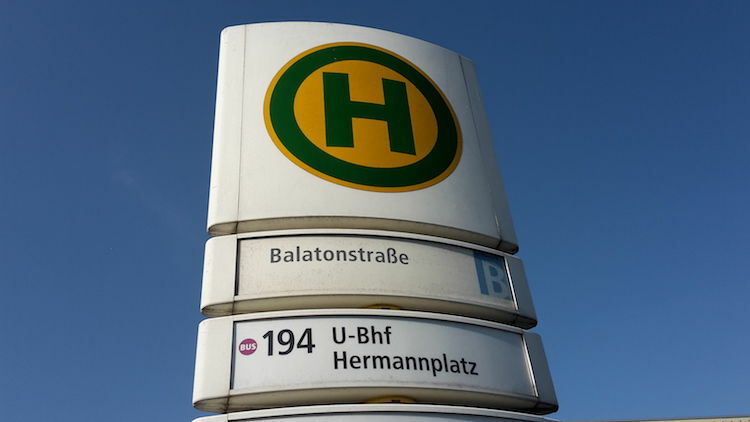 To know inÂ which zone a station or bus stop is in, just look at itsÂ sign, as in the photo above: In the lower right corner, you see the letter A, B or C. Or take a look at the usual map. So most likely, you will need a ticket for AB. But which is a cheap one? Let’s look at some monthly passes. This is a monthly pass that you can’t use during 3 and 10 a.m. on labour days. During all other times, including weekends, it works like a normal monthly pass â€“ just that it’s 27% cheaper: Instead of 81 â‚¬, you pay only 59 â‚¬ (AB zones). The 10-a.m.-ticket (10-Uhr-Karte) is a great option if your job starts later, you work from home, don’t work at all… â€“ or you’re riding before 10 a.m. less than 7 times per month (as 8 or more single trip tickets of 2.70 â‚¬ will outweigh your saving). Are you staying in Berlin for longer? Then you might consider buying a yearly ticket, maybe even in advance. And note: you are also saving if you are not using the ticket the whole year but only 10 months, since 10 monthly tickets are already more expensive than a yearly ticket. This one works only if you are going to school, doing an internship or an “Ausbildung”: Then you can get a Azubi/SchÃ¼lerticket, a discounted monthly pass. It costs roughly the same as the 10-a.m.-ticket â€“ but it is valid full-time. To get such a ticket, you first need to go to a S-Bahn or BVG counter and show some evidence, e.g. a contract of your internship â€“ and bring a photo. If they accept your evidence, they give you a customer card (Kundenkarte) with your photo on it. Then you can buy the actual monthly ticket at any vending machine or place. Don’t forget to write your customer number from the Kundenkarte on your monthly ticket, otherwise it won’t be valid. Worth mentioning are some extra features of the monthly/yearly passes. As you see, we can save a lot: Instead of paying effectively 2.70 â‚¬ per day for a regular monthly ticket, we can pay only 1.48 â‚¬Â with a 10-a.m.-ticket bought for a whole year. This is almost 50% less, just by combining Tip 1 and 2. And in case you need more info: Simply call the S-Bahn BerlinÂ or go to any customer center (Kundenzentrum), they also speak English. Have you found these tips useful? Then like and share this article. ðŸ™‚ Or tell us more tips in the comments!